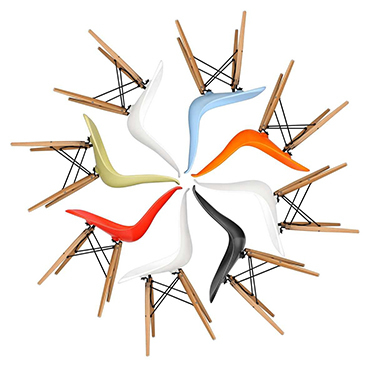 Lounging will never be the same again with our Charles Eames style La Chaise. With its beautifully sculptural form, La Chaise enables any number of sitting and reclining positions, and brings vintage glamour to any room. Our reproduction perfectly captures all the elements that made La Chaise so popular when it was launched. The uniquely curved frame, which reflects the shape of the human body, is made from high quality, glossy fibreglass. Like the original, it has a white lacquered finish and a wooden cross base. Charles and Ray Eames designed La Chaise in 1948 for the New York MoMA's 'International Competition for Low Cost' furniture. La Chaise didn't win, but its unique shape certainly made it one of the most notable entries, featuring in the catalogue and exhibition. Charles and Ray chose the name 'La Chaise' for two reasons. The most obvious is that it is the French translation of the furniture's form. But, as the couple observed, it also looks as if a floating sculpture by Gaston LaChaise would fit perfectly in the chair.